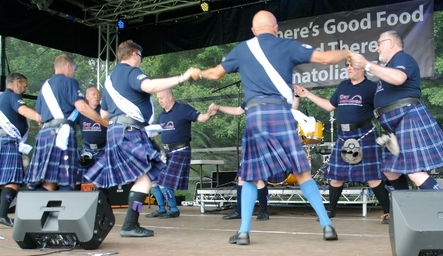 Welcome to the Gay Gordons Manchester Website, the home of Scottish Country and Ceilidh dancing for the LGBT Community in Greater Manchester and their friends. We are a group of Scottish Country Dance enthusiasts that felt the the Gay Community in Greater Manchester could benefit from something new and different. It is a great way to exercise, to meet new people and to learn a new skill. It is open to everyone within the LGBT Community and their friends - from complete beginners to the more advanced dancer. The only stipulation is that you are lesbian, gay, bisexual, transgendered or gay-friendly and are willing to dance. From Spring until late Autumn you will see the Gay Gordons Manchester within the Gay Village doing display dances and taking part in other major events throughout the year. Come along and join in the fun. This site is updated on a regular basis with the latest news on what is happening with the GGM. Why not become a member and make new friends. No experience of Scottish Dancing required, just a willingness to learn. * Due to Popular Demand we are holding a Day School on Saturday 6th April 2019.